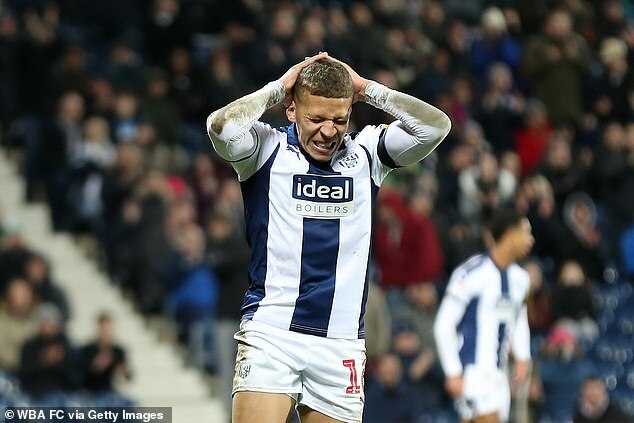 Dwight Gayle could face a retrospective ban for diving after he was hit with a Football Association charge following West Brom‘s 2-2 draw with Nottingham Forest on Tuesday. The Baggies striker went down in the penalty area under pressure from Alexander Milosevic and Yohan Benalouane in the 89th minute of the Championship clash at The Hawthorns. Jay Rodriguez duly equalised from the penalty spot to rescue a point for the hosts. An FA statement read: ‘West Bromwich Albion’s Dwight Gayle has been charged for ‘Successful Deception of a Match Official’ following the game against Nottingham Forest on Tuesday. ‘It is alleged he committed an act of simulation which led to a penalty being awarded in the 89th minute of the game. Last season Omar Niasse was banned for two games for diving after winning a penalty for Everton against Crystal Palace.